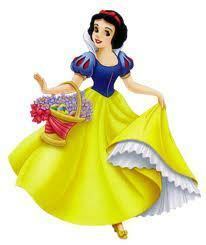 Snow white with basket. very nice basket along with snow white. Wallpaper and background images in the Snow White and the Seven Dwarfs club tagged: disney snow white and the seven dwarfs snow white. This Snow White and the Seven Dwarfs photo contains kirtle and polonaise. There might also be overskirt, gathered skirt, and crinoline.